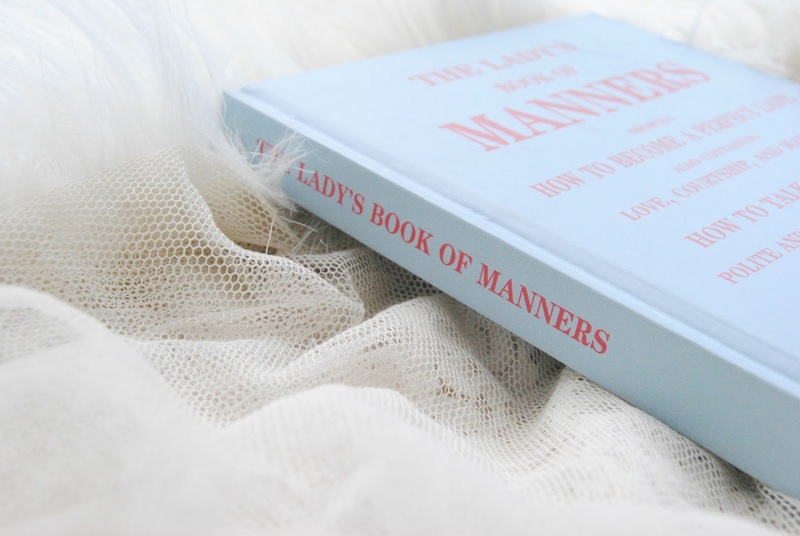 "Good manners are never out of fashion..."
"Politeness in life is ever more commanding than vulgarity." "Of all the sinners against the law of politeness, the bragger or the liar is one the greatest." "Never be ashamed to acquire the smallest grace by study and practise." "Nothing detracts more from the character of a real lady than the exhibition of envy." Hello my name is Leah, and I am absolutely delighted to be guest posting here on Vintage at Heart for the most lovely Harlow Darling! Harlow Darling also became a guest on my blog Confessions of a Vintage Hoarder back in July of 2013, her post on wearing Vintage Reproduction can be found here. Today I have put together this post in order to show a glimpse into a book I picked up from Kensington Palace on a past visit to London. I bought this book (originally published in London in the 1890s) as a novelty, expecting it to contain the most ridiculous rules for a lady of the 19th century to follow, and though yes there is some rather laughable "advice" within, there is also surprisingly a lot in this book that I feel both women and men of the 21st century should consider bringing back into action and following, some of which is shared above and below in this post. Do let me know if you agree or disagree with any of this 19th century "advice"! Words and actions - Politeness seems to be a certain care, by the manner of our words and actions, to make others pleased with us and themselves. The grand secret is to have an intention of always doing right. A lady's guide to talking well - Do not pretend to be what you are not, for no pretension can hide what you really are. Warm affections are as necessary to the talker as a clear intellect. Only the words which come from the heart go to the heart. Giving advice, unasked, is another piece of rudeness. It is, in effect, declaring ourselves wiser than those to whom we give. Do not permit his attentions - If you cannot love him wholly and solely, do not allow his addresses, however gratifying; do not permit his attentions, if you cannot give him hand an heart; such coquetting is highly blameable, and has frequently marred the happiness of many a worthy man. In seeking a partner for life, look to it that you be not entrapped by beauty of person merely. Choose a man of intelligence. Seek gentleness of spirit. Seek a lover of home. Let it be whom, to use the beautiful Arabian proverb, "you can make the keeper of your soul. First impressions - First impressions are generally most permanent, it is desired that they should be favourable ones. Be careful, therefore, to dress well, remembering that mental qualities are often judged by exterior. A girl with neatly and properly dresses feet, with neat, well-fitting gloves, smoothly arranged hair, and a clean, well-made dress, who walks well, and speaks well, and, above all, acts politely and kindly, is a lady, and no wealth is required here. Hold sacred the secrets of others - However candid and explicit you may think proper to be on your own affairs, remember to hold sacred the secrets of others, they belong not to you, therefore you have no right to make use of them. Distrust and friendship never do well together. One or Two - Expect not many friends, but think yourself happy, if through life, you meet with one or two who deserve that name. There is so very much to be said for good manners, being classy and graceful, and conducting one's self with the proper decorum. I will never, for the life of me, fully grasp why we as a society have let etiquette slip to the degree that it has. I want that book! Thanks for sharing it!